Binary is a base-2 number system that uses two mutually exclusive states to represent information. A binary number is made up of elements called bits where each bit can be in one of the two possible states. Generally, we represent them with the numerals 1 and 0. We also talk about them being true and false. Electrically, the two states might be represented by high and low voltages or some form of switch turned on or off. We build binary numbers the same way we build numbers in our traditional base 10 system. However, instead of a one's column, a 10's column, a 100's column (and so on) we have a one's column, a two's columns, a four's column, an eight's column, and so on, as illustrated below. For example, to represent the number 203 in base 10, we know we place a 3 in the 1's column, a 0 in the 10's column and a 2 in the 100's column. This is expressed with exponents in the table below. Or, in other words, 2 × 102 + 3 × 100 = 200 + 3 = 203. To represent the same thing in binary, we would have the following table. That equates to 27 + 26 + 23+21 + 20 = 128 + 64 + 8 + 2 + 1 = 203. You may be wondering how a simple number is the basis of all the amazing things a computer can do. Believe it or not, it is! The processor in your computer has a complex but ultimately limited set of instructions it can perform on values such as addition, multiplication, etc. Essentially, each of these instructions is assigned a number so that an entire program (add this to that, multiply by that, divide by this and so on) can be represented by a just a stream of numbers. For example, if the processor knows operation 2 is addition, then 252 could mean "add 5 and 2 and store the output somewhere". The reality is of course much more complicated (see Chapter 3, Computer Architecture) but, in a nutshell, this is what a computer is. In the days of punch-cards, one could see with their eye the one's and zero's that make up the program stream by looking at the holes present on the card. Of course this moved to being stored via the polarity of small magnetic particles rather quickly (tapes, disks) and onto the point today that we can carry unimaginable amounts of data in our pocket. Translating these numbers to something useful to humans is what makes a computer so useful. For example, screens are made up of millions of discrete pixels, each too small for the human eye to distinguish but combining to make a complete image. Generally each pixel has a certain red, green and blue component that makes up it's display color. Of course, these values can be represented by numbers, which of course can be represented by binary! Thus any image can be broken up into millions of individual dots, each dot represented by a tuple of three values representing the red, green and blue values for the pixel. Thus given a long string of such numbers, formatted correctly, the video hardware in your computer can convert those numbers to electrical signals to turn on and off individual pixels and hence display an image. As you read on, we will build up the entire modern computing environment from this basic building block; from the bottom-up if you will! As discussed above, we can essentially choose to represent anything by a number, which can be converted to binary and operated on by the computer. For example, to represent all the letters of the alphabet we would need at least enough different combinations to represent all the lower case letters, the upper case letters, numbers and punctuation, plus a few extras. Adding this up means we need probably around 80 different combinations. If we have two bits, we can represent four possible unique combinations (00 01 10 11). If we have three bits, we can represent 8 different combinations. In general, with n bits we can represent 2n unique combinations. 8 bits gives us 28 = 256 unique representations, more than enough for our alphabet combinations. We call a group of 8 bits a byte. Guess how big a C char variable is? One byte. Given that a byte can represent any of the values 0 through 255, anyone could arbitrarily make up a mapping between characters and numbers. For example, a video card manufacturer could decide that 1 represents A, so when value 1 is sent to the video card it displays a capital 'A' on the screen. A printer manufacturer might decide for some obscure reason that 1 represented a lower-case 'z', meaning that complex conversions would be required to display and print the same thing. To avoid this happening, the American Standard Code for Information Interchange or ASCII was invented. This is a 7-bit code, meaning there are 27 or 128 available codes. The range of codes is divided up into two major parts; the non-printable and the printable. Printable characters are things like characters (upper and lower case), numbers and punctuation. Non-printable codes are for control, and do things like make a carriage-return, ring the terminal bell or the special NULL code which represents nothing at all. 127 unique characters is sufficient for American English, but becomes very restrictive when one wants to represent characters common in other languages, especially Asian languages which can have many thousands of unique characters. To alleviate this, modern systems are moving away from ASCII to Unicode, which can use up to 4 bytes to represent a character, giving much more room! ASCII, being only a 7-bit code, leaves one bit of the byte spare. This can be used to implement parity which is a simple form of error checking. 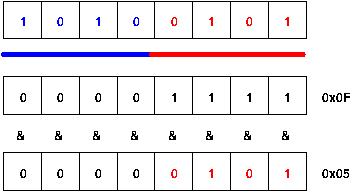 Consider a computer using punch-cards for input, where a hole represents 1 and no hole represents 0. Any inadvertent covering of a hole will cause an incorrect value to be read, causing undefined behaviour. Parity allows a simple check of the bits of a byte to ensure they were read correctly. We can implement either odd or even parity by using the extra bit as a parity bit. In odd parity, if the number of 1's in the 7 bits of information is odd, the parity bit is set, otherwise it is not set. Even parity is the opposite; if the number of 1's is even the parity bit is set to 1. In this way, the flipping of one bit will case a parity error, which can be detected. Numbers do not fit into bytes; hopefully your bank balance in dollars will need more range than can fit into one byte! Modern architectures are at least 32 bit computers. This means they work with 4 bytes at a time when processing and reading or writing to memory. We refer to 4 bytes as a word; this is analogous to language where letters (bits) make up words in a sentence, except in computing every word has the same size! The size of a C int variable is 32 bits. Modern architectures are 64 bits, which doubles the size the processor works with to 8 bytes. Computers deal with a lot of bytes; that's what makes them so powerful! We need a way to talk about large numbers of bytes, and a natural way is to use the "International System of Units" (SI) prefixes as used in most other scientific areas. So for example, kilo refers to 103 or 1000 units, as in a kilogram has 1000 grams. 1000 is a nice round number in base 10, but in binary it is 1111101000 which is not a particularly "round" number. However, 1024 (or 210) is a round number — (10000000000 — and happens to be quite close to the base 10 meaning value of "kilo" (1000 as opposed to 1024). Thus 1024 bytes naturally became known as a kilobyte. The next SI unit is "mega" for 106 and the prefixes continue upwards by 103 (corresponding to the usual grouping of three digits when writing large numbers). As it happens, 220 is again close to the SI base 10 definition for mega; 1048576 as opposed to 1000000. Increasing the base 2 units by powers of 10 remains functionally close to the SI base 10 value, although each increasing factor diverges slightly further from the base SI meaning. Thus the SI base-10 units are "close enough" and have become the commonly used for base 2 values. It can be very useful to commit the base 2 factors to memory as an aid to quickly correlate the relationship between number-of-bits and "human" sizes. For example, we can quickly calculate that a 32 bit computer can address up to four gigabytes of memory by noting the recombination of 22 (4) + 230. A 64-bit value could similarly address up to 16 exabytes (24 + 260); you might be interested in working out just how big a number this is. To get a feel for how big that number is, calculate how long it would take to count to 264 if you incremented once per second. Apart from the confusion related to the overloading of SI units between binary and base 10, capacities will often be quoted in terms of bits rather than bytes. Generally this happens when talking about networking or storage devices; you may have noticed that your ADSL connection is described as something like 1500 kilobits/second. The calculation is simple; multiply by 1000 (for the kilo), divide by 8 to get bytes and then 1024 to get kilobytes (so 1500 kilobits/s=183 kilobytes per second). The SI standardisation body has recognised these dual uses and has specified unique prefixes for binary usage. Under the standard 1024 bytes is a kibibyte, short for kilo binary byte (shortened to KiB). The other prefixes have a similar prefix (Mebibyte, MiB, for example). Tradition largely prevents use of these terms, but you may seem them in some literature. The easiest way to convert between bases is to use a computer, after all, that's what they're good at! However, it is often useful to know how to do conversions by hand. The easiest method to convert between bases is repeated division. To convert, repeatedly divide the quotient by the base, until the quotient is zero, making note of the remainders at each step. Then, write the remainders in reverse, starting at the bottom and appending to the right each time. An example should illustrate; since we are converting to binary we use a base of 2. Reading from the bottom and appending to the right each time gives 11001011, which we saw from the previous example was 203. George Boole was a mathematician who discovered a whole area of mathematics called Boolean Algebra. Whilst he made his discoveries in the mid 1800's, his mathematics are the fundamentals of all computer science. Boolean algebra is a wide ranging topic, we present here only the bare minimum to get you started. Boolean operations simply take a particular input and produce a particular output following a rule. For example, the simplest boolean operation, not simply inverts the value of the input operand. Other operands usually take two inputs, and produce a single output. The fundamental Boolean operations used in computer science are easy to remember and listed below. We represent them below with truth tables; they simply show all possible inputs and outputs. The term true simply reflects 1 in binary. Exclusive or, written as xor is a special case of or where the output is true if one, and only one, of the inputs is true. This operation can surprisingly do many interesting tricks, but you will not see a lot of it in the kernel. Believe it or not, essentially everything your computer does comes back to the above operations. For example, the half adder is a type of circuit made up from boolean operations that can add bits together (it is called a half adder because it does not handle carry bits). Put more half adders together, and you will start to build something that can add together long binary numbers. Add some external memory, and you have a computer. Electronically, the boolean operations are implemented in gates made by transistors. This is why you might have heard about transistor counts and things like Moore's Law. The more transistors, the more gates, the more things you can add together. To create the modern computer, there are an awful lot of gates, and an awful lot of transistors. Some of the latest Itanium processors have around 460 million transistors. We use these operations on variables to modify the bits within the variable. Before we see examples of this, first we must divert to describe hexadecimal notation. Hexadecimal refers to a base 16 number system. We use this in computer science for only one reason, it makes it easy for humans to think about binary numbers. Computers only ever deal in binary and hexadecimal is simply a shortcut for us humans trying to work with the computer. So why base 16? Well, the most natural choice is base 10, since we are used to thinking in base 10 from our every day number system. But base 10 does not work well with binary -- to represent 10 different elements in binary, we need four bits. Four bits, however, gives us sixteen possible combinations. So we can either take the very tricky road of trying to convert between base 10 and binary, or take the easy road and make up a base 16 number system -- hexadecimal! Hexadecimal uses the standard base 10 numerals, but adds A B C D E F which refer to 10 11 12 13 14 15 (n.b. we start from zero). Traditionally, any time you see a number prefixed by 0x this will denote a hexadecimal number. As mentioned, to represent 16 different patterns in binary, we would need exactly four bits. Therefore, each hexadecimal numeral represents exactly four bits. You should consider it an exercise to learn the following table off by heart. Of course there is no reason not to continue the pattern (say, assign G to the value 16), but 16 values is an excellent trade off between the vagaries of human memory and the number of bits used by a computer (occasionally you will also see base 8 used, for example for file permissions under UNIX). We simply represent larger numbers of bits with more numerals. For example, a sixteen bit variable can be represented by 0xAB12, and to find it in binary simply take each individual numeral, convert it as per the table and join them all together (so 0xAB12 ends up as the 16-bit binary number 1010101100010010). We can use the reverse to convert from binary back to hexadecimal. Hence 203 in hexadecimal is 0xCB. Whilst binary is the underlying language of every computer, it is entirely practical to program a computer in high level languages without knowing the first thing about it. However, for the low level code we are interested in a few fundamental binary principles are used repeatedly. In low level code, it is often important to keep your structures and variables as space efficient as possible. In some cases, this can involve effectively packing two (generally related) variables into one. Remember each bit represents two states, so if we know a variable only has, say, 16 possible states it can be represented by 4 bits (i.e. 24=16 unique values). But the smallest type we can declare in C is 8 bits (a char), so we can either waste four bits, or find some way to use those left over bits. We can easily do this by the process of masking. Remembering the rules of the logical operations, it should become clear how the values are extracted. The process is illustrated in the figure below. We are interested in the lower four bits, so set our mask to have these bits set to 1. Since the logical and operation will only set the bit if both bits are 1, those bits of the mask set to 0 effectively hide the bits we are not interested in. To get the top (blue) four bits, we would invert the mask. You will note this gives a result of 0x90 when really we want a value of 0x09. To get the bits into the right position we use the right shift operation. Setting the bits requires the logical or operation. However, rather than using 1's as the mask, we use 0's. You should draw a diagram similar to the above figure and work through setting bits with the logical or operation. Often a program will have a large number of variables that only exist as flags to some condition. For example, a state machine is an algorithm that transitions through a number of different states but may only be in one at a time. Say it has 8 different states; we could easily declare 8 different variables, one for each state. But in many cases it is better to declare one 8 bit variable and assign each bit to flag flag a particular state. Flags are a special case of masking, but each bit represents a particular boolean state (on or off). An n bit variable can hold n different flags. See the code example below for a typical example of using flags -- you will see variations on this basic code very often.